1/16 Decals for German Jagdtiger tank Discounts Apply ! ELA1608 - 1/16 Decals for German Jagdtiger tank, Early and Late. 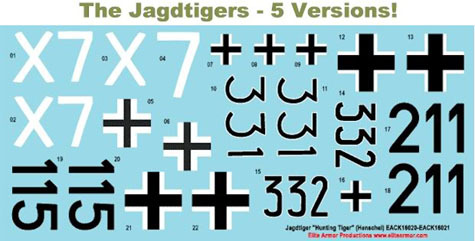 This exciting decal sheet has complete markings for 5 German Jagdtigers that served from 1944-1945. These decals are waterslide style, are very thin and includes a CD-ROM with full-color instructions. Discontinued Item.